It looks like there is a new Raspberry Pi computer about to be released very shortly. This time it's not a new size or form factor but a complete new generation: the Raspberry Pi 3. As Liliputing reports, we have excellent pictures, confirmation that the device is on the way, and some pretty deep technical details, of at least some aspects of the new design, thanks to an FCC filing (please note that these are PDF files but downloaded with .html extensions for me, so had to be extension-renamed). You can see pretty clearly the new circuit-board computer with its name inscribed in white on the green PCB. 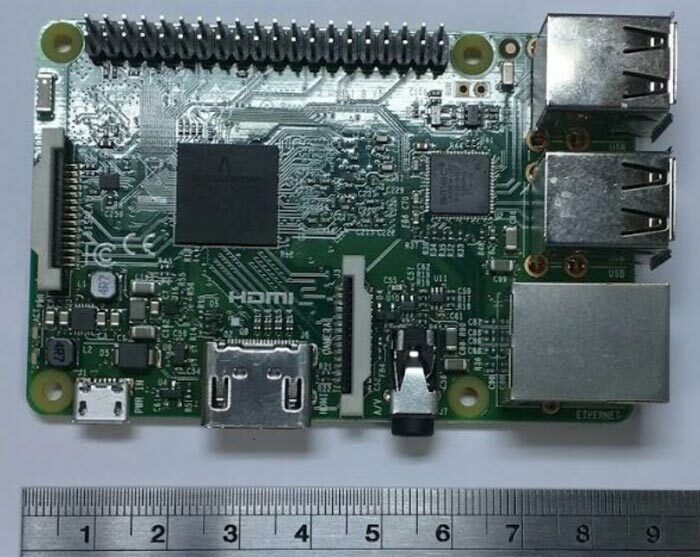 The example pictured by the FCC is named a 'Raspberry Pi 3 Model B v1.2'. The photos are quite detailed but compression, reflections and so on mean that not every inscription on the board and chips is readable. I can spy components such as 2xUSB (x2), Ethernet, HDMI, microSD and connectors labelled for display, camera and GPIO peripherals. However the biggest changes, it seems, are that the new RasPi will come packing wireless tech bringing greater unexpanded flexibility to the device. 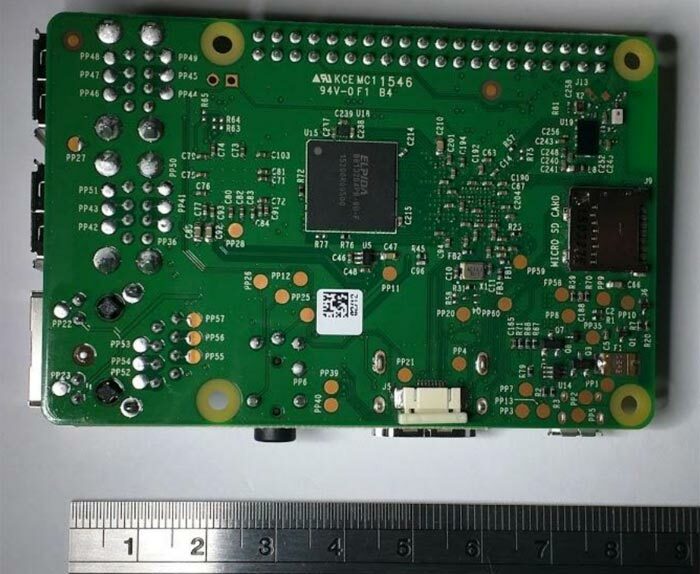 There is a ruler seen in the photographs which confirms that the new generation Raspberry Pi 3 keeps the same form factor as the previous model Bs, so will be compatible with a host of accessories already made for that system. The new Wi-Fi capabilities are probably limited to support up to 802.11n, but not the faster 802.11ac standard. Also you have Bluetooth LE connectivity built in. Some extra details emerged following the FCC documentation publication. PC World says that the Wi-Fi chipset is the Espressif ESP8266, which would add about $2 to the RasPi BOM. Another site, CNX Software, has a MagPi magazine cover stating that the Raspberry Pi 3 SoC will offer 64-bit processing and be clocked at 1.2GHz. The Raspberry Pi foundation won't up the price, as I understand from previous official communications and blog posts. With these leaks coming thick and fast the new Pi is expected to be officially launched this week, perhaps even later today (today is the 4th anniversary of the Raspberry Pi 1). UPDATE: The Raspberry Pi 3 has now been launched, priced at $35, you can head over to the official RasPi blog for more details and full specs. Turned out to be a BCM43438 instead of a ESP8266 - maybe they assessed both. The video decoder is now a lot faster, and the GPU is 20% faster, which I guess is better than a slap in the face. Lack of WiFi was the biggest complaint about the RPi, so it is good they fixed this, and also got to 1.2GHz too, so they're competitive there as well. For the price and for the support ecosystem, the RPi is hard to beat. But do I have to buy a new case? Just had to buy one straight away.